Every year in August between the 10th and 13th, we get the opportunity under good weather circumstances to observe the anual meteor showers caused by the Perseids. These small particles mainly made of dust are falling through the earth’s atmosphere from a radiant point in the sky located close by the Perseus and Cassiopeia constellations. These meteor showers are nonetheless remains of an old comet which passes close by our planet over a period of 130-135 years and was last seen in 1992 by the Japaneese astronomer Tsurukiko Kiuchi. The comet is named Swift-Tuttle after the two astronomers who independently were the first observers in modern history during the comet apperance in August 1862 (Lewis Swift and Horace Parnell Tuttle). Spectral analysis points out that this comet shares similarities with Halley’s comet which is rich in ammonia, water and carbon dioxide and also clasified as NEO (Near Earth Object) as it is approaches earth in a distance of 4 miljion kilometers. The chances of an impact with our planet is 1 in a 1,000,000 which is much less then the frightening asteroid called Apophis were chances are much larger; 1 in 15,000. This year our observatory will be opento public between 11th to 13th of August 21:30 to midnight allowing all interested to come and visit us under guidance from the observatory staff. This entry was posted in Astrophotography, Observation and tagged Astronomi, Astronomy, Astrophotography, Niklas Henricson, Perseid Meteor Showers. 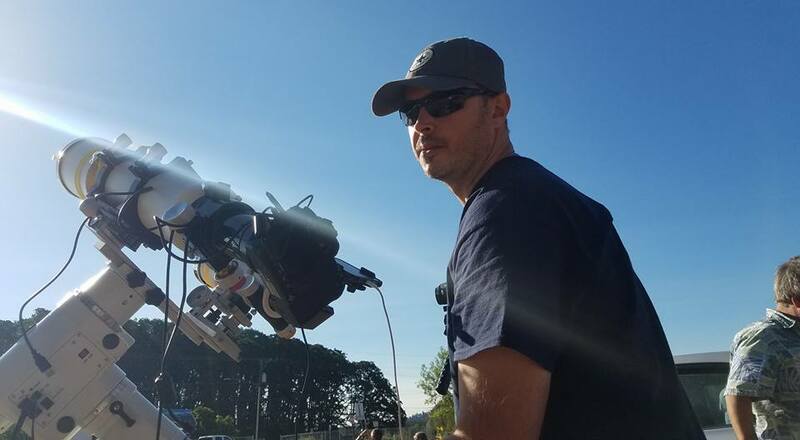 During June-July at Tycho Brahe observatory we were preparing for a large project that would involve the cooperation between many amateur astronomers from different locations in Sweden. 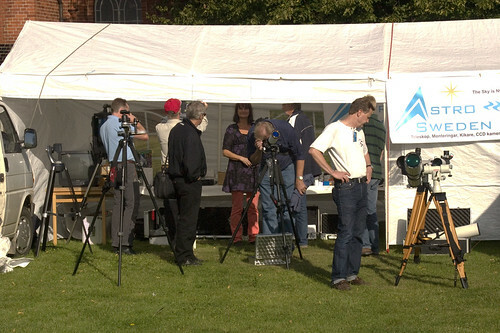 The Swedish assosiation for amateur astronomers (SAAF: Svenska Amatörastronomiska Föreningen) helped us to get in touch with other amateur astronomers across the country. Together with my collegue Arne L Ohlsson we started to put hard work on planning, coordinating meetings, assembling nessesary instrumentation and dealing with time pressure. The ockultation is all about a large rock out in space, or more commonly called an asteroid named 472 Roma passing infront of the delta star (Yed Prior) in the constellation of Ophiucus, causing this large red giant star to dissappear for a around 5 seconds. This asteroidal passage was meant to be easily observed from our location, but negative observations outside the occultation shadow would provide a lot of information regarding the star itself. It has been mistaken for a long time that the delta star in Ophiucus would be a double and for the first time an asteroid would occult this star and reveal it’s secrets for us. Unfortunately just before the occultation occurred, heavy clouds surounded our area. That was our worse case scenario that just took place, leaving us with unanswered questions. In the morning we heard that the German and Belgian astronomers were more lucky then us and that many positive reports started to fall in! This entry was posted in Astrophotography, Observation and tagged Astronomi, Astronomy, Astrophotography, Binary System, Niklas Henricson, Occultation, Science, Science Project, Skåne, Sweden, Tycho Brahe observatory. For almost a week ago we received our radio telescope which was originally owned by the institute of astronomy at Lund’s university. The telescope was used primarily by astronomy students. It weights around 200 kg and is 1,20 m across in diameter. With this telescope we will be able to observe regardless weather conditions and even at daytime the sun, some strong radio sources in Milky way and many other things. At the same time we have spoken with the architects from the municipality office regarding an extension building northside from our observatory. I will publish soon some blueprints which will give a clear picture of how our future observatory will look like. Because the building plans are not official yet, I’ll have to wait from publishing any further information regarding construction plans until all plans are set. 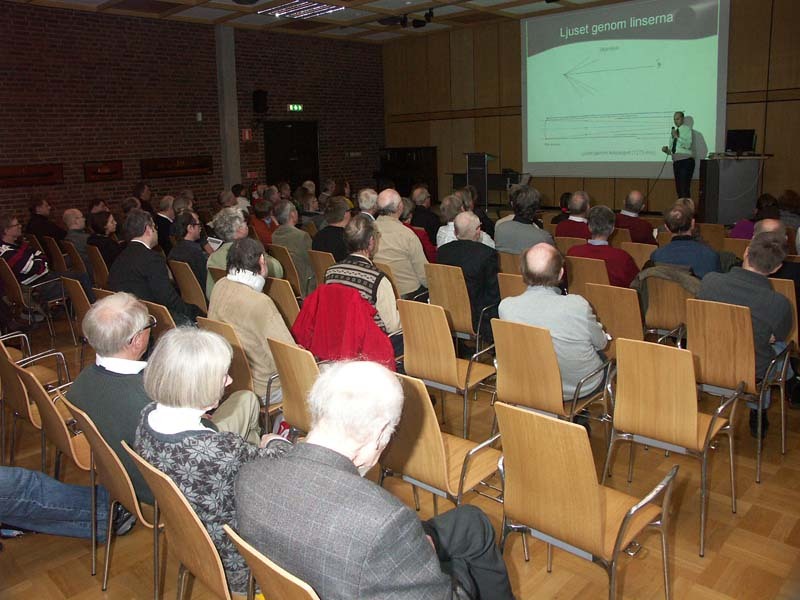 Last night I held a lecture about Galileo’s telescope for members in our Tycho Brahe astronomy society here in Skåne. 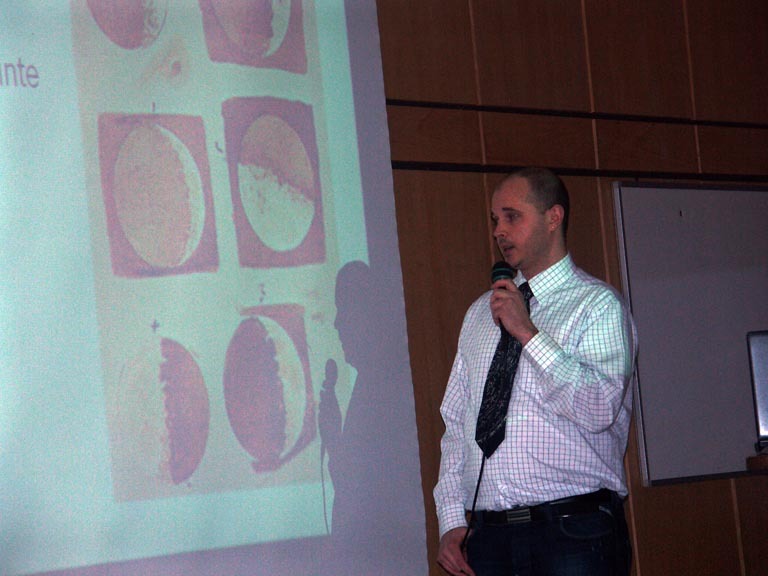 I would have kept going with my entire presentation for more then a hour but my time was limited to half. The lecture was describing the difficulties Galileo encountered in order to build his first telescope and the differences and achievements with later versions of his telescopes, as well as his first observations based on Jupiter, Venus and the moon that changed the world’s view. Unfortunately Bengt Rosengren a member in our astro-society felt ill and couldn’t attend our meeting. 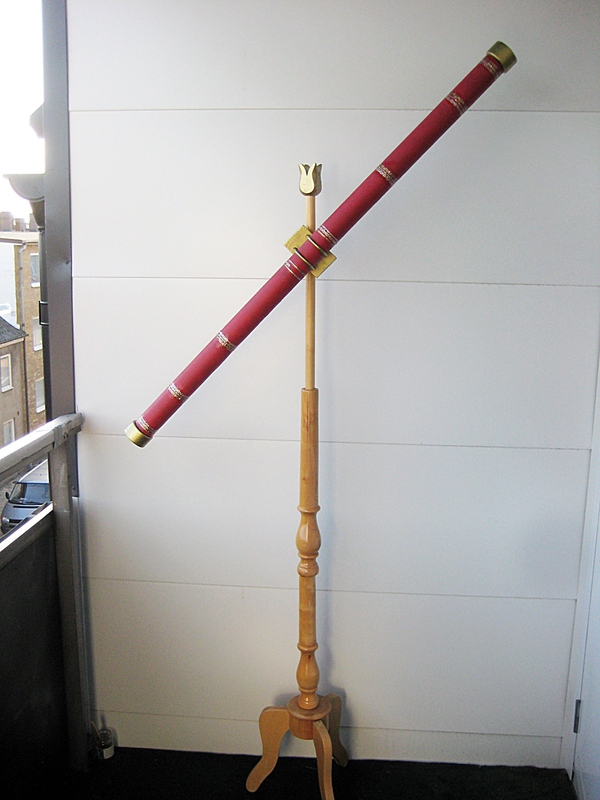 He has created a Galileo telescope replica which would be available for our attendees to study. I am providing an image from his replica here. This entry was posted in Astrophotography, News and tagged Lecture, Niklas Henricson, Radio Astronomy, Radio Telescope, Science Museum Malmö, Skåne, Sweden, Tycho Brahe observatory. Came back after an amazing weekend in Hven, a little isle between Denmark and Sweden where astronomer Tycho Brahe once was the head of Europe’s top astronomy researches, trying to resolve problems around the heliocentric model by observing the parallax between stars. We arrived there at Friday morning by car together with Sara and another member of the Tycho Brahe astronomy society. Sara and I decided to camp by assembling our tent close to the beach on the north-east side of the isle and by the time we were done, we attended our first workshop which was dedicated to Astrophotography. To my disappointment both course leaders were talking 2½ hours about their own telescopes and their old telescopes but nothing about astrophotography… Apart from a slide in their powerpoint presentation with around 30 terms in Astrophotography. During that time Sara had difficulties to keep herself from sleeping, so we decided to abandon this workshop and go for lunch. The coming days we explored a bit of the isle, eating in most of the restaurants, attending workshops, looking at books, filters, telescopes and talking to professional and amateur astronomers. 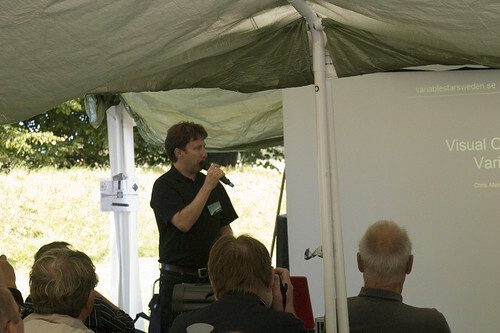 This event is the first of its kind in Scandinavia partly because we got many participants, but also because it was filled with lectures from professional and experienced amateur astronomers bringing up things about dark matter, exoplanets, variable stars and the cooperation between amateur and professional astronomers in matters of observational data and common research areas. Within a few days I will post a few links on videos from these lectures and workshops but apart from one lecture in English, the rest was in Danish and Swedish. Unless you understand Danish or Swedish I really recommend you to watch the lecture in variable stars given by Christopher Allen. 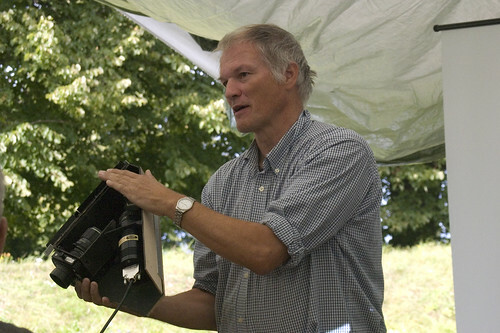 One thing that really brought up my curiosity was a lecture in Spectroscopy by Køge Bugt. It is amazing what amateur astronomers got in their hands when it comes to advanced equipment but also their enthusiasm on this kind of homemade research! 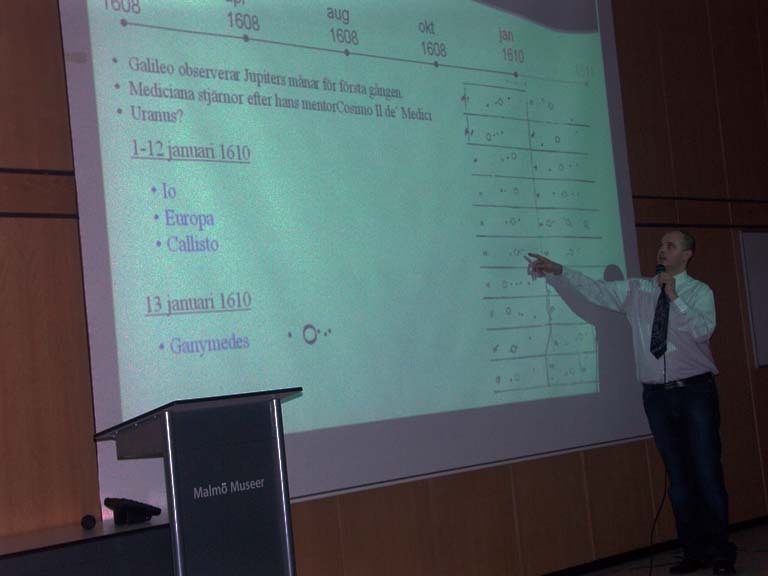 The event days came to an end by a few lectures from professional astronomers and a few words from the head of the board from Tycho Brahe Astronomy Society. This event went beyond my expectations thank to all effort, enthusiasm and energy that came from all the participants and people behind the scenes. I will get back with more photos soon! This entry was posted in Astrophotography, News, Observation, Reviews and tagged ASTB, Astronomi, Astronomiska Sällskapet Tycho Brahe, Astronomy, Astrophotography, Hven, Niklas Henricson, Skåne, Star Party, Sweden, TBOBS, Tycho Brahe, Tycho Brahe observatory, Ven. Finally! The weather allowed me to bring out my telescope. It was about time to run some tests with my Celestron NexImage camera. There were many attempts trying to adjust several parameters such as brightness versus contrast, frame rates, quality, shutter speed and so on. 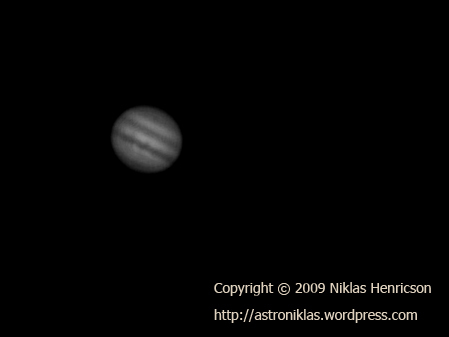 I finally found out what to do and was able to record a short movie of Jupiter and then process it in RegiStax 5. The trick is to capture a planet by recording an AVI-movie, process it through Registax, do final adjustments in Photoshop and voila! 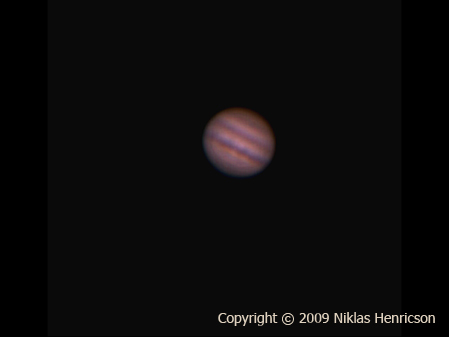 This entry was posted in Astrophotography, Observation and tagged Astronomi, Astronomy, Astrophotography, Celestron, Jupiter, NexImage, Niklas Henricson, Planets, Science, Skåne, Sweden. It was almost full moon (-1 day) and I was in big hurry to get a few shots of the moon surface before fog and clouds would set an end to this observing session. The results of this session were not up to my expectations but I hope for a cloudless and clear night for next time. The individual exposures were quite good considering the fog and small clouds that passed before the moon from time to time. On the southern hemisphere of the moon you clearly see the Tycho crater named after Tycho Brahe, a Danish astronomer from the mid 15th century. It got a high albedo and the impact resulted in a crater which is quite recent in astronomical terms (108 million years ago). Samples from this crater were collected during the Apollo 17 mission which was the last manned mission to the moon. Apollo 17 was unique in its way, partly because the first scientist (Harrison Schmitt) was onboard on a mission to land on another celestial object and also because of the lengthy moon-walks. The goal was to gather as many samples from soil and stones as possible. One of the questions that often arise is, how is it possible that the moon is battered by so many impact craters while the earth does not reveal such landscapes? Scientists have come to the conclusion that earth does not look the same due to erosion and atmospherical and geological activities. Today it is known that the moon had volcanic activity and also that the existence of the moon was a result of a great impact by another large celestial body that crashed into the proto-earth. 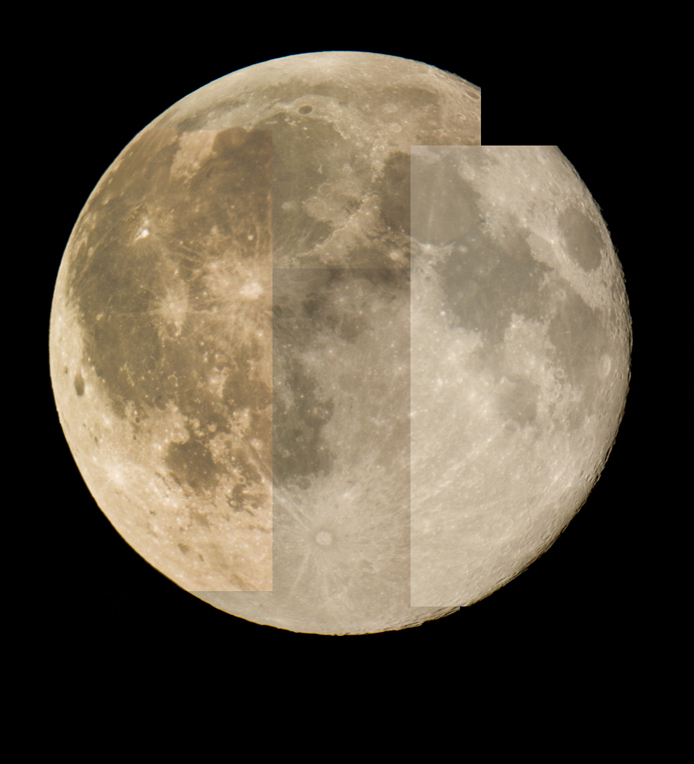 This is proven by the fact that the moon and the earth share the same basic geological structure according to the samples gathered from moon’s surface during the Apollo space missions! This entry was posted in Astrophotography, Observation and tagged Astronomi, Astronomy, Astrophotography, Niklas Henricson, Skåne, Sweden.